Story: This is the story of the greatest actress of all time based on the autobiography of Savitri Garu. Review: Firstly special thanks to Keerthi Suresh and Nag Ashwin for taking up this magnum opus biopic of Savitri Garu. I personally love Savitri gari cute, chubby, innocent, lovable, comic timing expressions along with her dialogue delivery. When you start watching the film, you will enter into the world of Savitri and also feel she is acting in her own biopic. 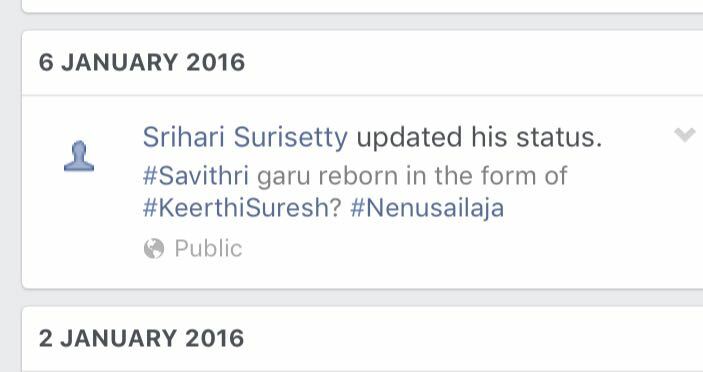 Such is the dedication by Keerthi Suresh and resemblance to Savitri was also an added advantage to the film. Here is my find when she(Keerthi) did her first film in Telugu. 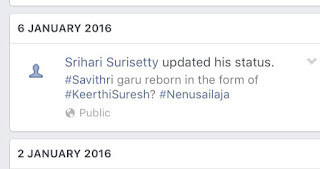 Keerthi just lived the life of Savitri in the film. Perfect find for the role. She just recreated the 50's life of mahanati and her roles. I have seen few of the films acted by Savitri garu. I could definitely feel that Keerti resembles her in the walking, posture, attitude, acting and innocence. Dulquer Salman, my favorite from malayam industry proved with his ease of portraying the role of Gemini Genesan. How many of you started hating Dulquer for this role? Means he lived in the role of GG. Rajendra Prasad, Prakash raj, Naga Chaitanya, Srinivas Avasarala, Krish, Shalini did their part with so much comfort in their respective characters. Mohan Babu as SVR was perfectly suited.Samantha and Vijay did their job well. Nag Ashwin have taken take care of the very minute detail in the film. He created the character of Singitam though it doesn't create an impact. How many of you know that Singitam Srinivas worked as assistant director under KV reddy. I personally liked the scene where Naresh says 'I don't know Savitri, I know only Savitri Garu'. That shows the respect to savitri garu. Music : Mickey has given the best music for this film which comprises of old melody like Mooga Manasalu and Title track was the main highlight for the film which depicts the life of Savitri in the complete song. Bottom line: Savitri Garu lives ON.